The news about the eviction of two female students from Symbiosis Law School, Hyderabad on October 26 generated a furore of sorts among the legal community. Media reports claimed that the two girls, Apoorva YK, and Snigdha Jayakrishnan, both fourth-year BA LLB students, were castigated for having spoken out against Asst. Professor Srinivas Methuku on Facebook and accusing him of “constant ogling and causing discomfort.” However, the claim is just a part of the numerous conflicting reports and rumours that have since been doing the rounds, with the college administration asserting that their eviction was a result of separate disciplinary committee proceedings against the duo, unconnected with the sexual harassment allegations levelled by them. Here is an attempt at putting the dots together. The two girls had written a complaint letter on April 1 to the National Commission for Women and Child Development, Ministry of Human Resources Development, and the State Women’s Commission about institutional mismanagement of sexual harassment complaints. Contrary to news reports, the complaint against Prof. Srinivas Methuku was one among the four sexual harassment allegations mentioned in their letter. “A group of female students complained against Asst. Professor Srinivas Methuku of constant ogling and causing discomfort, Director M.I Baig allegedly passed a remark that his eyes are like that which is not his problem. At this point, no written complaint was taken against the accused and no procedures were followed. The accused had allegedly humiliated a female student by questioning her about her relationship with a boy in the campus and nothing was done about it,” the letter had said. The Ministry was then responded to by Dr. MS Shejul, the University Registrar, stating that Prof. Methuku had been reprimanded by the Director. The response had further stated that the other allegations mentioned in the complaint were simply misconstrued by the girls as sexual harassment or that action had already been taken on the complaints. The institution's Internal Complaints Committee (ICC) that did take up the matter later allegedly posed demeaning questions to the girls, while trivializing the allegations. Cut to October 9, Apoorva posted a screenshot of an anonymous Instagram story by a girl alleging harassment at the hands of Prof. Methuku. While students were then asked to submit their complaints for consideration by the ICC, Snigdha soon put up another Facebook post, alleging "procedural errors and callousness" on the part of the college authorities in dealing with sexual harassment allegations. Despite such shortcomings, eight students deposed before the ICC. However, as of October 26, Apoorva and Snigdha claim to not have been informed of the ICC decision or any progress made on it so far. Meanwhile, disciplinary committee action was initiated against the duo for violation of hostel rules-- complaints that they allegedly weren’t ever informed about or heard on. Speaking to LiveLaw, they said that the disciplinary committee did send them emails to appear before it, but as per their account, the committee curiously conducted its proceedings during the summer break, when the girls weren’t available at the college campus. “To this day we neither know what are the particular charges, if at all the committee came to conclusion about the matter we're never informed. Neither were we called to attend any proceedings in this semester nor served any warning, notice there of with regard to any disciplinary matter verbally or written or electronic media (sic),” the two girls now wrote in a Facebook post. They were soon served with a warning to take down the Facebook posts, or face consequences. Two days later, they were handed over eviction notices. However, they claim that no suspension or rustication letters were given them, and hence, they are still unaware of details of the disciplinary committee action taken against them. As regards the action taken against Prof. Methuku, while Dr. Pooja Malhan, Head of Student Affairs at SIU refused to disclose any details, Times of India quotes Vidya Yeravdekar, Principal Director of Symbiosis International University as saying that he was suspended on October 15 as an interim measure. Within the Hyderabad campus, however, the opinion has been divided. 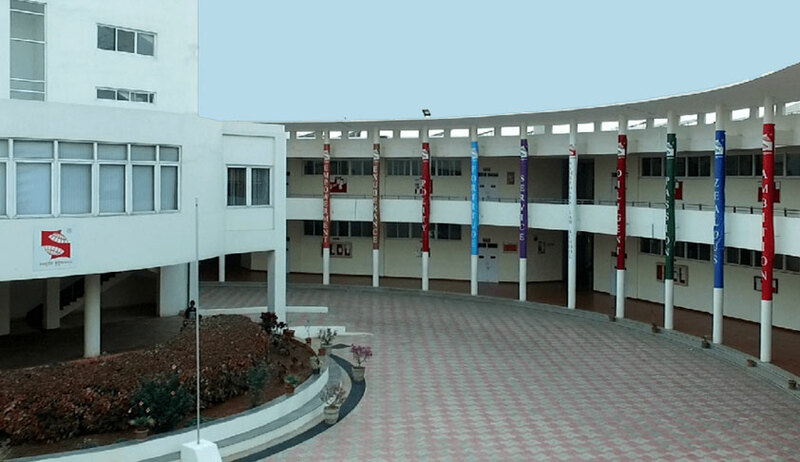 On one hand, allegations of moral policing came forth as well, with female students alleging that they were being reprimanded for their choice of clothes. A few other students claimed that they were coerced into signing statements against Apoorva and Snigdha. On the other hand, some students told LiveLaw that the issue of sexual harassment had already been looked into and had reached its conclusion with the accused professor having been suspended indefinitely. Nevertheless, what has emerged is a tale of constant miscommunication among the faculty and the students, with several rumours doing rounds. While Apoorva and Snigdha say that they were orally told about their rustication, other students are still unclear about their suspension/rustication and the period thereof, and are only aware of them being evicted from the college hostel. Moreover, it is still unclear whether Apoorva and Snigdha were given a fair hearing before being evicted from the campus. The incident has also snowballed into what several students described as a “continued trampling of dissent” within the college campus over the past several years. Moving across state boundaries, the episode has especially generated a furore among students of Symbiosis Law School, Pune, with the college Director’s name continuously cropping up. While the students from the sister campus did not wish to be named, they recalled their own experiences where they were compelled to take down posts about the college from social media platforms. The “arm-twisting”, they said, ranged from expulsion warnings and suspension from mooting and other co-curricular activities, to threatening retraction of recommendations given to students for higher studies. The college has continually relied on its “code of conduct” to effect these disciplinary actions, often handing these out without proper procedure or hearing, they added. One such alumna recollected the events that unfolded after the suicide of a fellow batchmate. With students distressed at the news, two Facebook posts were written—one about the lack of mental health awareness in colleges by Ms. Shilpa Gamnani, and another about the absence of “effective college representation at a student’s cremation and the suspicions of college inaction over her mental state while she was alive”, by her friend. The latter had in fact called for an independent enquiry into the circumstances surrounding the student's suicide, as is normal procedure when any such incident takes place in an educational institution. He was, naturally, asked to recant his statement, failing which the college assured him of action against him. Later that night, he was served with a show cause notice, which contained allegations against him, along with a predetermined punishment i.e. suspension, should he fail to prove his case in the disciplinary committee hearing scheduled early the next morning. “While college rules mandate that such a disciplinary committee hearing has to be held in the presence of a parent or a guardian, my friend's parents were given a 12 hour notice to fly in for the same,” she adds. Shilpa was served with a notice as well, allegedly two hours before the proceedings to show cause as to why she should not be expelled over her Facebook post. Her friend was asked to give an undertaking, assuring the college that he would take down the Facebook post and apologising to them for being rude during the proceedings. “The disciplinary proceedings against my friend and I were ultimately disposed of, as my friend's father refused to back down, even under threats of expulsion. Our story is just another in a series of attempts at SLS Pune to suppress any attempts to question the administration, and they will go to any lengths to hide the ineptitude and apathy of their staff,” she asserts. Law school campuses throughout the country have, over the past few years, witnessed similar concerns being raised. Having contacted several students for their views on the issue revealed an atmosphere of distrust that the incident has perpetuated. It has also brought to the fore certain other procedural and communication lapses that definitely need to be given due attention to. While press releases have been issued since, the students are now faced with two sides of a story, and are burdened with the truth of their own past experiences with the college administration. They have since spoken about issues ranging from the lack of an independent student body on campus to voice their concerns, to violation of the code of conduct by disciplinary committees. Further, the purported handling of the sexual harassment allegations by the college has also been found to be inept by several students. Speaking to LiveLaw, a student spoke about her own harassment as a toddler, and expressed her discontent at the college’s response to the movement and the handling of the Apoorva and Snigdha’s case. “A couple of days ago, a video was circulated by the college that rubbished this whole me too movement and an ex faculty member went so far as to say "I don't have me too moments, I have I slapped him back moments." I was curious to ask said member if she expected a five year old me to first of all comprehend what is happening, realize that I shouldn't be facing this and then slap the boy who was nearly twice my size? The way the SIU has reacted to the cases of sexual harassment in Hyderabad added with my own director's reaction and involvement in the same makes me feel more unsafe. “Is this what will happen to me if I stand up against a professor in this college? Maybe what the student said may be exaggeration. But Vidya Yeravdekar literally said that TNG students do such acts. It is shameful to see that if you stand up for the right, your academic records are used against you,” she said. Anyway, the truth of what went down with Apoorva and Snigdha is certainly getting tougher to ascertain with every passing minute, with several students claiming that there are concerted efforts from stakeholders to manipulate the narrative and discredit the two of them. A video made by unknown persons has also been doing the rounds since, with CCTV footage of the two students having a verbal altercation with the security staff. The video, which largely echoes the allegations of the college administration, emerges as a condemnable and direct attack on the character of the two students. At this juncture, it therefore needs to be borne in mind that justice should not only be done but seen to be done, and right now, the steps taken by the authorities must be directed towards clearing the air within the campus rather than setting its public image straight, if it wants to regain the trust posed in it by the students.